Firstly…how long until I need to make the switch to the nbn™? Eighteen (18) months after the nbn™ Fibre has rolled into your area the copper telephone lines will be cut off and you will need to choose an nbn™ approved phone provider to organise a VoIP plan. Or just use your mobile phone plan. Installing the NBN network across Australia is going to take nbn™ around 10 years in total. The current plan is to roll out fixed line NBN region-by-region to 93% of Australian premises. The remaining 7% where fibre/fixed line can’t reach will be connected via fixed wireless and satellite technologies. The government funded organisation entrusted with rolling out and delivering the nbn™ network infrastructure across Australia. RSPs – what are they, how many are there, and do they all offer the same thing? These are the companies or retailers you purchase your internet plan from. Originally the nbn™ came up with their own term for these retailers – RSP’s or Retail Service Providers. But really they are the good ‘ol fashioned ISPs or Internet Service Providers as we all know them by. There are over 140 RSPs at last count in October 2017! Not all are in a position to provide nbn™ services to all areas. They all have varying data plans, pricing, and levels of support. Some only supply services to very large businesses, and some just supply residential plans. To confuse the situation a little more some of the Backhaul providers (see below) are also RSPs meaning they have a wholesale division purchasing backhaul and a retail division selling internet plans. And the wholesale division in most cases, also sells to other RSPs! There are many links in the flow of data and nbn™ network illustrated in detail below. Also noted in that diagram are where the most common congestion issues we have all read about and are experiencing from time to time are occurring. Congestion is unfortunately and inherent and current problem … the important thing is how quickly it is acknowledged and alleviated by Backhaul providers. And also how how seriously your RSP takes this congestion and that they continue to put pressure upstream to relieve the congestion. If all RSPs will suffer from Backhaul congestion, which RSP should I choose? Choose an RSP who is transparent, flexible, and in control of who they use for backhaul. They ideally need to be in control of their own side of the network meaning they can upgrade their network capacity immediately if required. They should act quickly on any individual speed, dropout, or poor performance concerns with thorough trouble shooting and where applicable a fault lodged with the backhaul provider as an official “on notice” that there are potential congestion issues that need to be resolved sooner rather than later. The more genuine faults that are submitted puts increasing pressure on them. Being quiet or apathetic will mean backhaul providers will squeeze as much as they can out of current capacity as few people are complaining. Don’t be duped in to thinking that biggest is best, smaller RSPs who control their side of the network and with Australian based support will hands down, in most cases provide better customer service, transparency, honesty, and apply pressure on backhaul when required. The Point of Interconnect (POI) is one of the crucial links in the nbn™ network delivery chain. Getting online isn’t as simple as connecting to a local network in an end-user premises and browsing the internet. The reality is there are multiple interconnected networks that help get end users online. Local networks in end-user premises connect to the nbn™ network, then to RSP networks, before an online request can be sent out to the World Wide Web. A POI is much like the old copper telephone exchanges role where they house a virtual circuit that allows the internet to reach the end user…you. The Connectivity Virtual Circuit (CVC) is the amount of network capacity shared across a RSP’s end-user premises. It is purchased based on the bandwidth required to service all RSP’s end-user premises aggregated by that CVC. RSPs can choose to connect to a few or all 121 POIs that are part of the nbn™ network. These backhaul networks carry data between the end user’s closest POI and the RSP’s closest data centre. Once the data reaches the data centre, it is identified and sent on its way to its destination. This destination may be overseas, it may be within the data centre itself, or it may be elsewhere within Australia. If it’s elsewhere within Australia, the RSP network may take it directly there, or it may take it back to the nbn™ network. In this case, it would take it all the way to the closest POI to the destination, at which point the nbn™ network would take over again and finish the journey. RSP backhaul networks beyond the POI are important because they are outside of the NBNCo. control and have the potential to impact online performance for end users. If an RSP does not own and operate their own backhaul network, and most don’t, they must lease capacity from a provider that does. This is similar to the way that NBNCo. leases capacity over the nbn™ network. Should I be interested in Backhaul? Generally no, you shouldn’t need to be interested. Though you may be interested from time to time as the capacity of backhaul can at times affect your internet experience. This affect may be short term or longer and is usually congestion/capacity related. 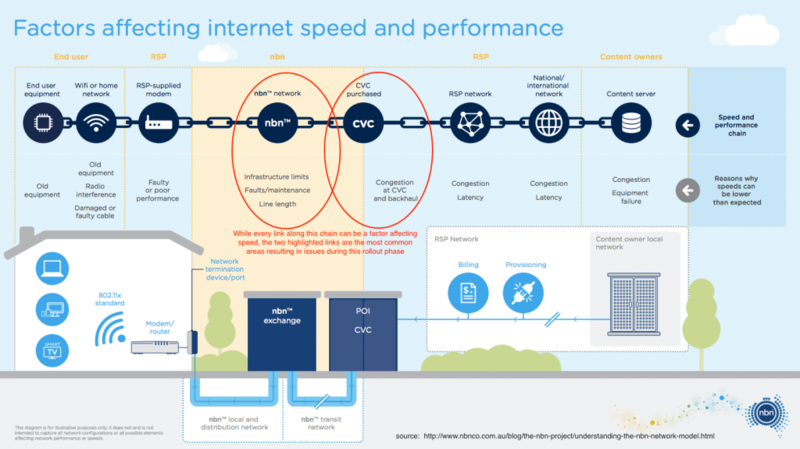 Who really is in control of NBN speed and performance? The answer…the Backhaul providers – the aggregators/wholesalers/middlemen. No one talks of them. And everyone is getting it wrong thinking it is the front line Retail Service Provider’s not buying enough bandwidth. Incorrect! RSPs must purchase tails or access to the backhaul. It’s a complicated network using multi technologies thanks to the political U-turns and inefficiencies. But it’s simple where the majority of issues lie – circled in the network diagram above. There are 5 Speed Tiers measured in Mbps download/upload: 12/1, 25/5, 25/10, 50/20, 100/40. Not all providers will offer all these tiers. It’s important to note that the speed tier is a guide provided by the nbn™ and that there are several factors that can affect your experience such as how the NBN Backhaul is configured and how much bandwidth is available – particularly during peak times, your modem/routers specifications and Wi-Fi speed, how your provider designs its network during peak and off peak times, the quality of the content you are viewing and the source of it i.e where it originates from in the world and the capabilities of that source to adequately deliver the content to all users at any one time without quality degradation. But above all it is Backhaul capacity that will determine your speed an streaming experience.